Starting last year, and ramping up exponentially in recent months, chatbots have rapidly become one of the most talked about trends in technology. Chatbots — systems using artificial intelligence to process chat-based inputs, either text or speech, and respond in kind — have been around in various formats, both real (SmarterChild) and imagined (HAL 9000) for ages. Only recently, however, has the combination of AI advances and ubiquitous computing started to push them into the mainstream. 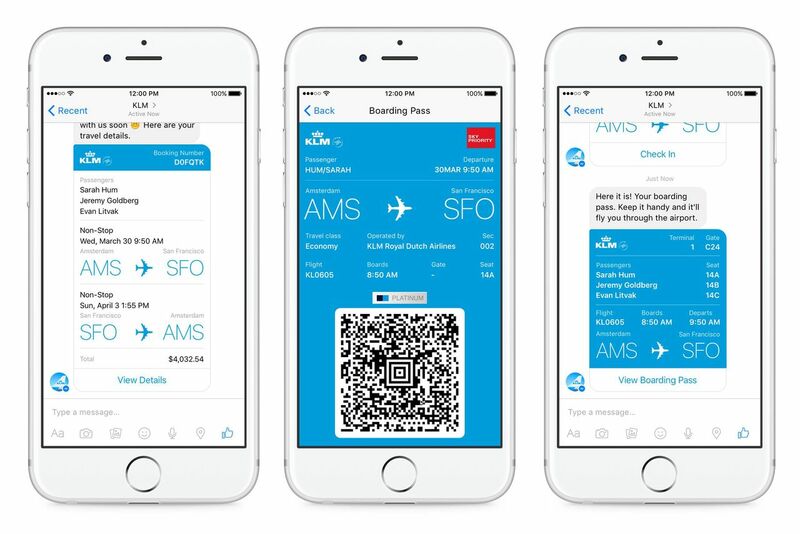 With the launch of chatbot-enabled messaging platforms like Facebook’s recently launched Messenger Platform, chatbots now have the potential to reach huge audiences. What’s the appeal of chatbots? Chatbots allow users to interact with multiple services from within a single interface — in many cases, an interface they may already be using to talk to friends and coworkers. While each chatbot might have a unique image and personality, the UI around them will be relatively consistent within the chat platform. Talking to AI bots is still far from feeling particularly human, but the ability for systems to process text and speech and respond appropriately has made significant advances. Imagining a bank example, if you were interacting with a human teller, you might reference an account as simply “my checking account”, and the teller would know which account you meant — ideally, this interaction could play out identically with a chatbot. Compare that to a web-based system, where this same input might just be a form field labeled “Account,” with options like “ADV CHECKING xxxxxxxx1234”. While not unfamiliar, this type of input has a distinctly different feeling. Unlike more rigid inputs, chat UIs are adaptable and can more readily respond to nuances in language, and potentially even respond in kind. As a result of the ability to process language, chatbots are often well suited to receive voice commands and respond with audio. This makes chatbots usable without the need for physical interaction, increasing their accessibility and expanding potential contexts for use. There’s a reason almost all ads featuring virtual assistants showcase an array of people exercising, cooking, holding kids, and otherwise in need of hands-free interaction — this type of functionality is difficult with most other types of applications. Chatbots provide a natural opportunity for content to be pushed to users, rather than waiting on users to request it. While this is common on mobile application platforms, each push opens in a different app, which can be tedious when there’s more than one notification to go through. Conversations happen asynchronously, so in cases where a response can’t be immediate, users can more naturally divert their attention to other things and see the response once available. Waiting is rarely, if ever, a desirable experience, but a passive background experience where results are pushed to you is a much more acceptable experience than actively waiting for a load screen to complete, or waiting on the phone for a customer service representative to pick up. What seems to work well? Asking a question and getting a response is one of the oldest usages of chatbots, and one that’s often promoted within modern virtual assistants (“Siri, what’s the weather tomorrow?”; “Alexa, what time is it?”). Beyond providing information, many chatbots allow users to complete actions, such as adjusting a thermostat temperature or completing a purchase. Typically, this is only likely to work well when there are a limited number of inputs, and many of the details are already known by the user. Trying to answer 20 related questions one-by-one would quickly grow tedious and it may be difficult to review or update past inputs. Logging hours into a time tracking system, for instance, could very easily be done via chatbot: “Add 30 minutes to Blog Post.” Generating an invoice, where you need to input line item details, billing information, and contact information, may present a more challenging experience within chat. Similarly, trying to browse through many options in a chat environment may quickly grow onerous — “What’s the cheapest flight to Chicago” is a simple interaction well suited to a chatbot as there’s likely only one result, however the response to “show me all flights to Chicago” may be much more difficult to present effectively within a chat platform. Chatbots provide a unique opportunity to interact with users in a way that can seem new and exciting, which can be leveraged in applications purely designed to be fun and interesting. Googling “bad jokes” and reading a page full of one-liners is simply not the same experience as saying, “Siri, tell me a joke,” and hearing a robot tell a joke. While chatbots may work well for some things, they’re not well suited for everything. As mentioned already, long forms and extensive browsing are just two examples where a chat UI may be less desirable than a more traditional UI. The adaptability of chatbots, however, can help bridge these gaps as the chatbot can act as the central hub and push users to alternate UIs as needed. If a user request requires a complex form, the bot could respond with a message telling the user they need to complete the form, with a link and an estimate of how long it should take. Outside of complex inputs, some interactions may require human intervention. Not unlike a clerk handing over advanced cases to their manager, chatbots provide an opportunity to shift from AI to human and back again as needed to complete a task. Just make sure to clue users into what’s happening to avoid confusion or mistrust when the “bot” suddenly seems far more human. Bender: Admit it! You all think robots are machines built by humans to make their lives easier. 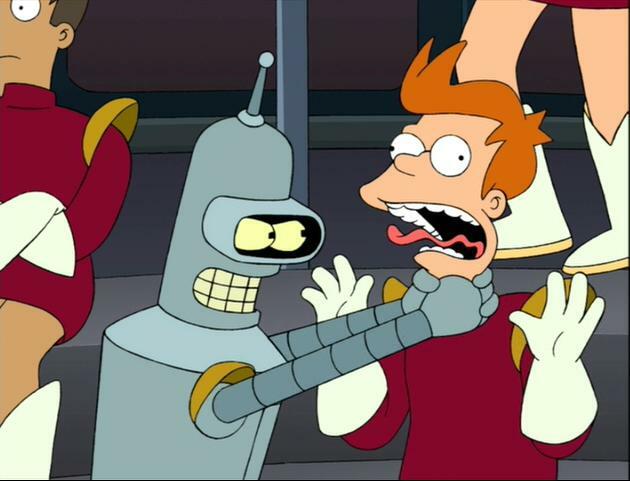 Bender: I’ve never made anyone’s life easier and you know it! Remembering keywords and phrases can be more difficult than selecting options shown on a screen. Ensure users can easily find out what’s available from the chatbot and complete actions. Once users begin a workflow, ensure they can easily undo mistakes or exit completely. If you’ve used complex customer support phone trees (“Press 2 for…”), where misinterpreting an option can quickly lead you deeper into the system with no way out other than to hang up and start over — not an enjoyable experience. While push notifications can be helpful, they can very quickly get annoying. Use sparingly, and ensure users have robust control over when and how they receive unprompted communication. Giving your chatbot a sense of liveliness is tough, and there are many examples where this has quickly gone wrong. Be exceptionally conscientious of the decisions made regarding personality, avoiding gender stereotyping, and eliminating the possibility for undesirable messaging to come through. Ensure the tone and voice is appropriate for the context. Handling large financial transactions, for instance, may require a sense of professionalism and trust that won’t come through if the language used is particularly casual or full of slang. While chatbots are not new, their place in the modern technology landscape is still being forged. Similar to the growth of mobile apps, chatbots are likely to see a boom where many are built and released, including many of questionable user value, and many that differ greatly from what’s out there today. Observing what’s out there, what succeeds, and fails will help hone in on which opportunities make the most sense for chatbots, as well as how to best harness the unique approach they provide.